You will earn 7345.00 bonus points. ? "Kennedy" leather stationary collection is exquisite in design with full back and arm diamond tufting and brass nail head trims. The hand-finishing leather with multi-tone effect complements the overall rich look. This collection is not only about style, down feather seating cushions offer you lasting performance. There are four main characteristics or "blemishes" of natural leather: scratches, wrinkles, insect bites and natural healed scars. 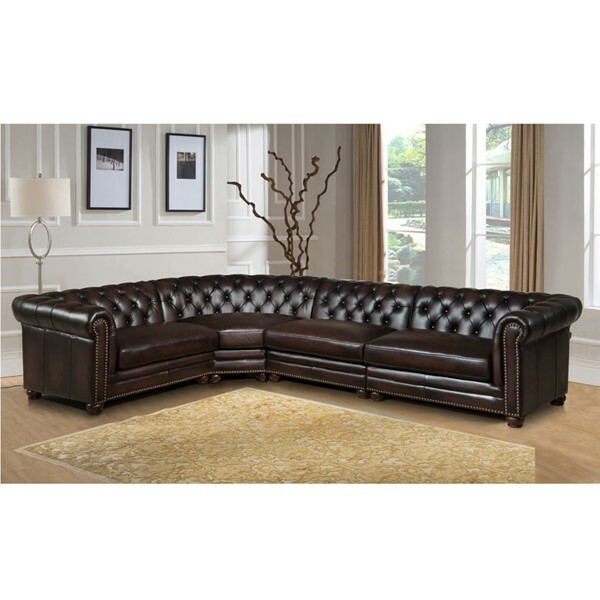 "Kennedy" uses a unique hand-finishing leather upholstery. The intricate hand-finishing process results in a multi-toned leather color, which means the overall leather is not a solid color. It is a mixture of multiple color tones. Additionally, the hand-finishing process may expose the natural blemishes of real leather, and scars and natural lines may show. These "kisses of nature" enhance the overall appeal of truly premium leather. Leather swatch samples are available at no additional cost. Color as pictured may slightly differ from actual product. Top Grain Hand-Rubbed Leather with split: Top Grain Leather is used on the seats, inside backs and top of arms where the body touches. Split is used on outside arms, outside backs and bottom edge. Kiln dried solid wood frame with glued corner blocks ensures strength, stability and durability. All the back padded by plywood with foam. Reinforce all construction. Seat cushion with down feather : Pocket coil seat cushions feature 2.26 foam core double wrapped with hollow fill fiber. This way the core will not overly soften loft wise.